Security clearances granting access to state secrets have become increasingly politicized in a bid by opponents to block senior advisers to President Trump from joining the closed White House community of those with access secret intelligence. In February, intelligence agencies denied a high-level security clearance to Robin Townley, an African affairs specialist and close aide to then-White House National Security Adviser Michael Flynn. The denial of the Top Secret, Sensitive Compartmented Information clearance, the high-level security clearance known as TS/SCI, was widely viewed as a bureaucratic power play by opponents of both Flynn and Townley inside intelligence agencies. Angelo Codevilla, an intelligence expert, said the denial of clearances was engineered by the CIA and came despite Townley's holding of the high level clearance for many years when he worked at the Defense Intelligence Agency. The clearance denial drove Townley out of the White House National Security Council staff. The apparent motivation was political, as Townley was known inside government as a critic of the current intelligence structure. Townley, like Flynn, advocated for intelligence reforms designed to improve what many critics regard as an outdated system of intelligence agencies. "The CIA did not want to deal with him," Codevilla stated. "Hence, it used the power to grant security clearances to tell the president to choose someone acceptable to the agency, though not so much to him." Flynn also is under scrutiny from the Pentagon inspector general over foreign payments he received after retiring as an Army three-star general and whether they were reported on security clearance forms. Several months before Townley's clearance denial, Democrats on Capitol Hill complained about plans to give high-level security clearances to Trump's daughter Ivanka Trump, and her husband, Jared Kushner. Both were granted interim TS/SCI clearances and currently are presidential advisers. The blocking of security clearances under Trump contrasts with the handling of clearances during the Obama administration when a key liberal adviser with a questionable security background was given a high-level clearance. 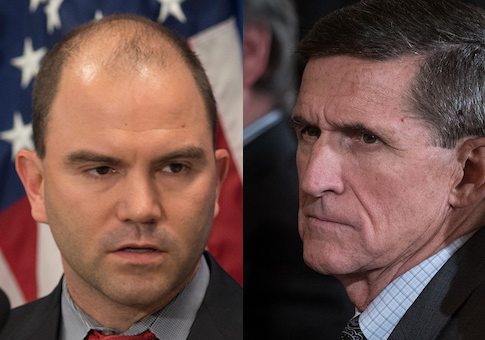 Ben Rhodes, the White House deputy national security adviser for strategic communications under Obama, was denied an interim TS/SCI clearance by the FBI in October 2008, according to an email obtained from John Podesta last year. The email stated that Rhodes was the only White House official out of 187 prospective White House aides to be denied the interim TS/SCI clearance. Yet, despite the denial, Rhodes would later be granted access to some of the most secret U.S. intelligence information and emerge as one Obama's closest aides who boasted of a "mind-meld" with the president on various issues. Rhodes became one of the most active originators and shapers of key American foreign and national security policies under Obama. He engineered what he dubbed the "echo chamber" of pliable news reporters and think tank experts who could be relied on to spread White House propaganda, including false and misleading information, to the American public on the Iran nuclear deal in a bid to win congressional backing for the accord. Two House Republicans asked the FBI in January to investigate how Rhodes was granted access to secrets for eight years after the initial denial of an interim clearance in 2008. Regarding Ivanka Trump and Kushner, two House Democrats, Rep. Elijah Cummings (Md.) and Rep. Bennie Thompson (Miss.) complained on Twitter in November that granting clearances to the couple would be improper and a conflict of interest because they were in business and lacked government experience. High-level security clearances are granted to White House officials so they can participate in various activities, including policy development work, meetings with the president and senior advisers, working groups, and intelligence briefings. Most internal meetings are classified and thus a security clearance is required for access. Denying a clearance to an official can be tantamount to firing. In the White House complex, junior clerical staff members often are granted TS/SCI clearance. Most jobs inside the White House complex, which includes the executive mansion and the adjacent Eisenhower executive office building, where the National Security Council and other key posts are located, require the TS/SCI clearance. Other clearance levels include Secret and Confidential. The process for gaining a clearance includes filling out Form SF-86 that requires disclosing details of past employment and finances. Chinese hackers were able to gain access to millions of the secret and highly sensitive forms during the hack disclosed last year of the Office of Personnel Management. The stolen SF-86s were among some 22 million documents on federal employees stolen and could greatly assist Chinese intelligence agent recruitment and cyber espionage operations. Ground for clearance denial can include illegal drug use, contacts with foreign governments, or a history of bankruptcy. The TS/SCI clearance grants a holder access to special intelligence, such as information obtained from foreign recruited agents and electronic communications intelligence. The clearance also can include signing extensive non-disclosure agreements. This entry was posted in National Security and tagged White House. Bookmark the permalink.